If I had to mention one dish in the Italian repertoire that epitomizes elegant summer eating, this might well be it: vitello tonnato, also called vitel tonnè in dialect, which means’ tunnied veal’ or simply veal in tuna sauce. More often than not, though, it is called by its Italian name in English as well. It makes for an elegant presentation, fit for an important dinner, but it is actually quite easy to make and, if made with pork or turkey rather than veal, quite inexpensive, too. After the aromatics and liquids have simmered for about 10-15 minutes, add the meat, raising the heat if need be to keep the water simmering nicely but it should not boil, which would toughen the meat. I cover the pot partially to reduce evaporation. Simmering time will depend on the meat you use, but the classic recipes call for cooking the veal roast around 60-90 minutes, depending on the size and the cut. (The original cuts were suitable for long simmering, modern recipes often call for loin, which should be just cooked through.) Pork loin should take about 60 minutes or less, while the tenderloin, which is quite a ‘skinny’ piece of meat, should take no more than 20-30 minutes. Turkey breast should take about the same as pork tenderloin. Remove the pot from the heat and allow the meat to cool completely, still immersed in its cooking liquid. This should take about an hour or so, and it results in a moister and more flavorful meat. But if you are in a hurry, you can remove the meat from the liquid and place it in the fridge to cool down quickly. While the meat is cooling, it is time to turn to the sauce. 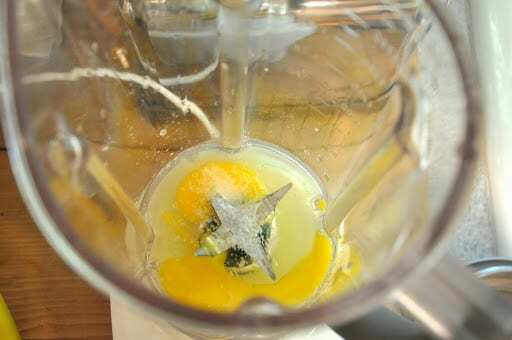 You begin by making a mayonnaise in a blender: place the two whole eggs (not just the yolks) in a blender with the juice of half a lemon and pinch of salt. 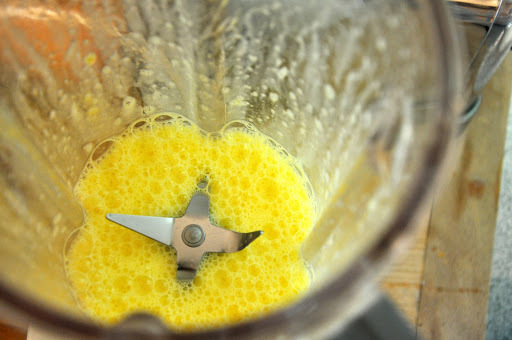 Now turn the blender on again and, with the little clear plastic ‘window’ in the lid removed, starting pouring in olive oil little in a slow but steady stream, until the eggs and oil emulsify and you get a nice, thick and creamy mayonnaise. I believe that the classic proportions call for one cup of oil per egg, but I usually ‘eyeball’ it and stop when the mayo is nice and thick, as pictured below. By the way, this is one case where so called ‘light’ olive oil may be better than the dark green fruity kind, which would give the sauce a too strong olivey taste. Or you can use Provençale olive oil, which is more delicate.In any event, once your mayo is ready, add a fillet or two of anchovy, a spoonful of capers and a can of tunafish (preferably packed in olive oil). Blend again until smooth. Then temper the sauce with a couple of spoonfuls of the meat cooking liquid, enough to produce a pourable but still quite quick sauce. Transfer to a bowl.When the meat has achieved room temperature, remove it from its broth, pat it dry and place it on a cutting board. Slice it against the grain into thin slices. Other cuts are larger, so you will probably need to make a single row or arrange them in a circular pattern on a large platter. Before you are ready to serve, garnish the dish with capers and, if you like a more elegant presentation, some thin slices of lemon around the edges and some parsley leaves. If you want to save yourself the trouble or if you are worried about using raw eggs, you can use commercial mayonnaise instead of making it yourself. Just add a good two cups of mayo into the blender along with the tuna, anchovies and capers and whizz away. Or you can try the original recipe, which did not call for mayonnaise at all. Artusi, for example, calls for passing the mashed tunafish through a sieve, then adding enough olive oil and lemon juice to produce a nice creamy sauce. You can achieve a similar effect in the blender, set on ‘liquify’. Artusi also suggests not throwing the cooking liquid away, but saving it for use in a risotto, which strikes me as good advice. You can also simplify the dish a bit by doing what most recipes call for: rather than coating each slice of veal in the sauce, line the bottom of your platter with some sauce, lay down the slices and cover them with the rest of the sauce. The slice by slice method is my own ‘take’ on the recipe, but one that I think pays off, as it ensures that each and every slice is enveloped in the sauce, keeping it moist and lending maximum flavor. As mentioned, veal loin is the classic meat. And the classic cuts are either the coscia (leg), girello (top round) or magatello (eye of round), all of which allow for long simmering without drying out; modern recipes sometimes call for the fesa (rump). In the US, these cuts of veal are not all that common, so veal loin can be substituted—and simmered for less time, more like 45-60 minutes than 60-90. These days, pork loin or turkey breast are common substitutes, even in Italy. And, if you ask me, pork tenderloin makes for a wonderful version of this dish—every bit as good, perhaps even better, than the original. 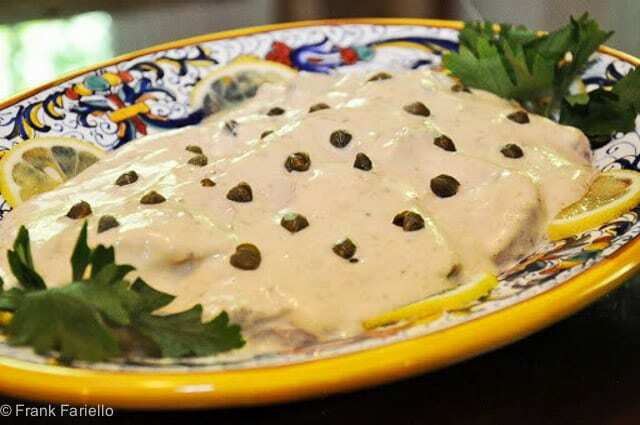 The origins of vitello tonnato are subject to some confusion, in part because it is typical of two adjoining but different regions of northern Italy, Lombardia and Piemonte.. According to Anna del Conte in her Gastronomy of Italy, the original version, without mayonnaise but include a bit of cream, comes from Lombardia. When it was taken up by the piemontesi, they added the mayo under French influence. On the other hand, the Oxford Companion to Italian Food has an entirely different explanation: they say that the mayonnaise version is indeed from Piemonte and the original one while the Milanese version is served hot, larded with garlic and pot roasted, the cooking liquid mixed with tunafish and thickened with a roux. And many Italians apparently believe that the dish has French origins, perhaps because of its French-sounding dialectal name, vitel tonnè, but that is apparently not the case. It is a summer dish par excellence that can serve as antipasto or a light secondo, as you prefer. 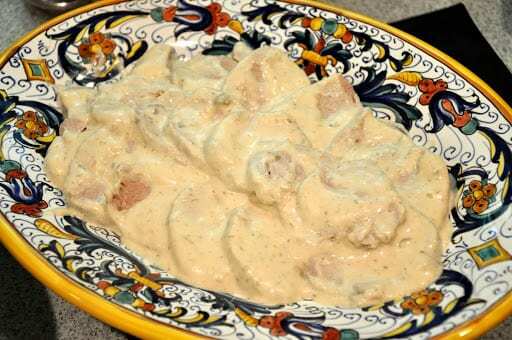 In Lombardia, strongly associated with the summer holiday of Ferragosto on August 15, but, if you ask me, vitello tonnato is just too good to serve it only once a year. 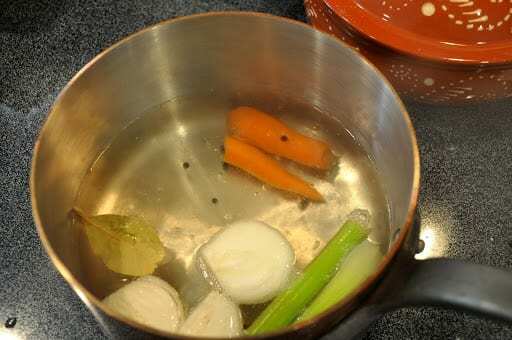 After the aromatics and liquids have simmered for about 10-15 minutes, add the meat, raising the heat if need be to keep the water simmering nicely but it should not boil, which would toughen the meat. I cover the pot partially to reduce evaporation. Simmering time will depend on the meat you use, but the classic recipes call for cooking the veal roast around 60-90 minutes, depending on the size and the cut. (The original cuts were suitable for long simmering, modern recipes often call for loin, which should be just cooked through.) Pork loin should take about 60 minutes or less, while the tenderloin, which is quite a 'skinny' piece of meat, should take no more than 20-30 minutes. Turkey breast should take about the same as pork tenderloin. 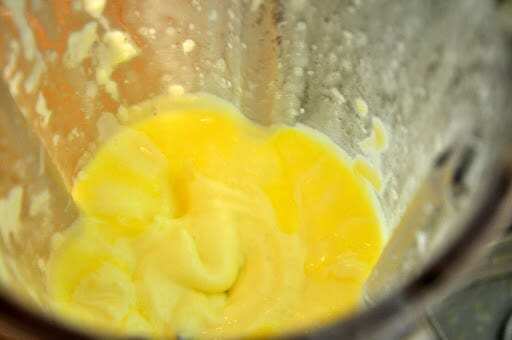 Now turn the blender on again and, with the little clear plastic 'window' in the lid removed, starting pouring in olive oil little in a slow but steady stream, until the eggs and oil emulsify and you get a nice, thick and creamy mayonnaise. I believe that the classic proportions call for one cup of oil per egg, but I usually 'eyeball' it and stop when the mayo is nice and thick. By the way, this is one case where so called 'light' olive oil may be better than the dark green fruity kind, which would give the sauce a too strong olivey taste. Or you can use Provençale olive oil, which is more delicate.In any event, once your mayo is ready, add a fillet or two of anchovy, a spoonful of capers and a can of tunafish (preferably packed in olive oil). Blend again until smooth. Now take each slice (you'll probably need to do this by hand, otherwise use tongs) and dip in on each side in the tuna sauce and arrange the slices on a platter, each slice just slightly overlapping like so many roof tiles, in an attractive pattern. While pork tenderloin, there will be room for several rows of meat. Other cuts are larger, so you will probably need to make a single row or arrange them in a circular pattern on a large platter.Finally, finish the dish off by pouring over the top the remaining sauce. While you can serve the dish right away, it develops better flavor if you let it sit for several hours, overnight or—in some recipes—for a few days, so the flavor of the tuna sauce penetrates the meat completely. Before you are ready to serve, garnish the dish with capers and, if you like a more elegant presentation, some thin slices of lemon around the edges and some parsley leaves. I am confused. Is this supposed to be served cold, hot or at room temperature. Help anyone? Frank, For some reason I can’t see the photos for this recipe. I’ve tried Chrome, Firefox and Safari with no luck. Any ideas? Sorry Nellie! We’ve been having some issues with the photos on the site ever since we recently switched servers. Check out the post now—you should be able to view the photos. If not, let us know! 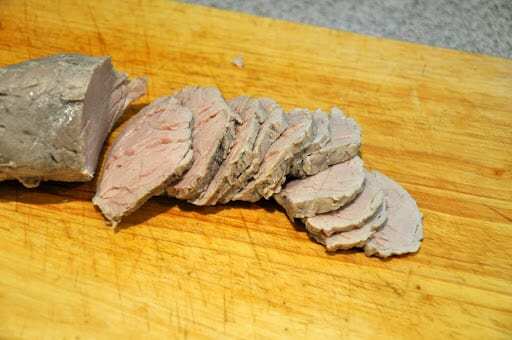 I have been looking for a good recipe for vitello tonnato – I can’t find the one I used to make – got lost in a house move and this one looks very close to it. Che bontà !! This is a wonderful version and I’ve made it number of times now. Thanks so much! I have also made this one today … due to your description I have made mayonnaise myself for the first time! It worked beautifully! The whole dish … divine! I will use the broth for cooking lentils. 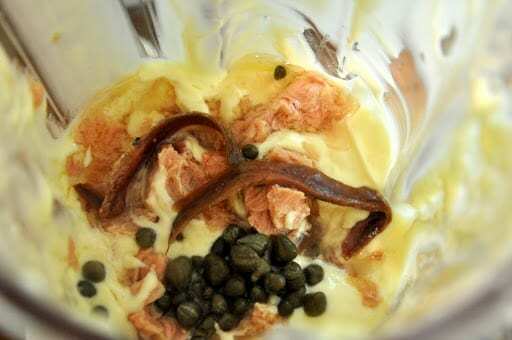 Love the sneaky ingredients in the mayo “a fillet or two of anchovy, a spoonful of capers and a can of tuna fish”. More like I like sneaking anchovies in to recipes when ever I get the chance to! mmmmmmm, this is a great blog and reminding me of some of my first meals with my in-laws in Italy. Beautiful dish and recipe. I am toying with doing the tuna-olive oil combination. Yes, in my head, it is all coming together as I look at your enticing photos. This is one of my favorite sauces. Great post Frank, I bet that veal tasted awesome! The emulsion sauce with the eggs, anchovies, capers, and tuna is quite similar to a salad dressing that I make with the exception of the tuna. I love the idea of using either pork tenderloin or turkey breast meat for the main protein in the court bouillon. We do eat a lot of veal as escaloppes with capers in France! Your concept is new to me! Ever heard Janis Joplin singing Summertime? Oh my! You have hit upon my most favorite Foodie experience! We had this dish for the first time in a gorgeous Bistro Cafe in the Galleria Vittorio Emanuele. Unforgettable! Love the way you create this recipe making it easy for anyone. Love, love, love Vitello Tonnato! They used to serve it at a restaurant I worked out and now I cannot find the same version anywhere. Had it with roast turkey once and it was also good. Thanks for the recipe! Will definitely be making it soon! Its the tuna sauce I die for! Could put it on anything! I've never been brave enough to whizz a can of tuna with mayo you may have given me the inspiration I need.